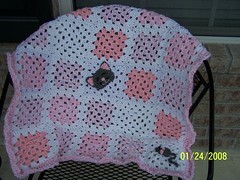 Here is the finished afghan from my stash of pink and white yarns…..I think it turned out cute! That is adorable! I LOVE the cat and mouse, so cute. I love the idea of the rat and the cat. Fantastic! Oh that is cute! The cat looks very happy with herself! Oh my that is just adorable, great job! Don’t forget to upoad your photo into the FLICKR group. I love it! You work FAST girl!!!! Thank you for all the comments. I apologize for not replying when they hit my computer. It was killing them off as spam. I got it worked out though….well, my hubby got it worked out!